The Rock Solid Aero Elbow is the perfect adapter to tilt and rotate equipment and monitors to the ideal angle. The Rock Solid Aero Elbow is the perfect adapter to tilt and rotate equipment and monitors to the ideal angle. The elbow is made entirely of lightweight aerospace aluminum and supports a maximum load capacity of up to 80lbs (36.5kg)* The elbow is designed with TruVu locking technology which adds versatility and ensures secure placement of equipment. One end of the Elbow has a 5/8″” (16mm) Baby stud that positions and locks onto any 5/8″” (16mm) equipment such as Tether Table workstations, Wallee Connect iPad Mounts, or Local Vu monitor mounts. 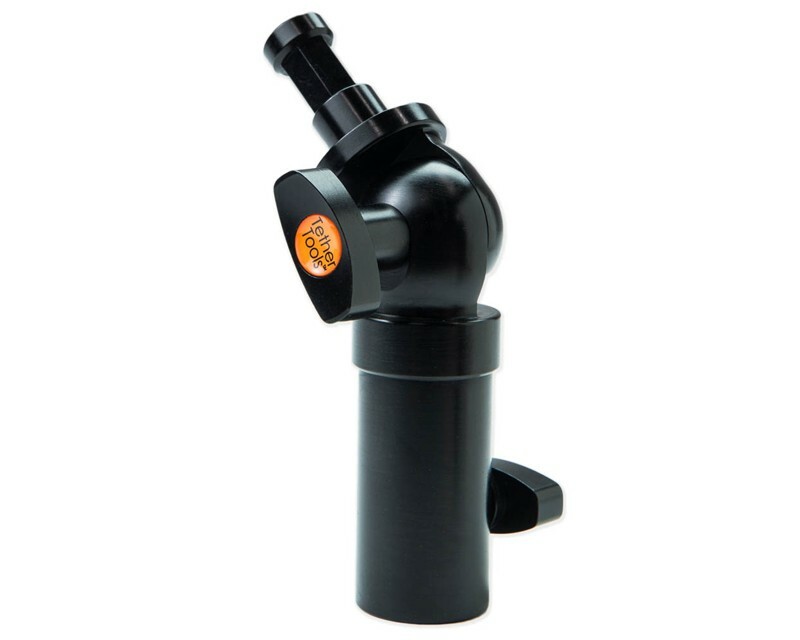 The other end of the elbow has a 5/8″”(16mm) Baby receptor as well as a 1 1/8″” (2.85cm) Junior Stud to position securely on any grip gear such as light stands, booms, or Master Clamps. The Aero Elbow provides 180º tilt and 360º rotation. The Hex head prevents unwanted rotation when equipment is mounted and TruVu technology enables a secure lock so there is no sagging or movement when equipment is mounted. Many elbows or pins rely on friction and the over-tightening of knobs to hold equipment in place. Unlike traditional designs, the Aero Elbow utilizes TruVu Technology, a system that, once set, securely locks in place, prevents movement or sagging, achieves precise results, and provides peace of mind that equipment is safe. *The Rock Solid Aero Elbow is rated to hold equipment up to 80 lbs(36.5kg), however, always refer to maximum load limits on stands and clamps. Those weight limitations ALWAYS take precedent. For larger monitors always position the display over one of the stand legs. The use of a sandbag on the opposite leg of the monitor is recommended This listing is for the Aero Elbow attachment only. All other items pictured are sold separately.